And for that matter, is it ”Bernsteen” or “Bernstine”? | Comics I Don't Understand - This site is now being updated daily at http://www.comicsidontunderstand.com. Please change your bookmark if necessary, and notify any web site with a link to the old address. And for that matter, is it ”Bernsteen” or “Bernstine”? Wikipedia says it’s “bern-stine”. It also says the song by R.E.M. that involves shouting Mr. Bernstein’s name is “It’s the End of the World as We Know It (And I Feel Fine)”. I guess I can understand a matter of opinion of Bernsteen vs Bernstine for those who’ve only heard it and not seen it or know who the hell Leonard Bernstine is. What I don’t understand is why this was submitted. Michael Stipe is clearly visible under the R.E.M. poster celebrating the tour 20 years ago. I can understand not knowing who Stipe is or even who R.E.M. are, but even if the original submitter never heard the song, if they’re smart enough to submit it to cidu, they’re probably smart enough to check wikipedia. Okay, so the comic means that 20 years ago R.E.M. released Pig & Rat’s favorite song of all time, so they decided to turn it on and jam. Apparently even after 20 years they still only know four words to the lyrics, which I totally understand. I can only remember 1 1/2 verses (not the first), and can never even make it to the chorus if I ever try to karoke it. I did not remember the song from that one lyric, but I should have figured it out from their headgear. The Pearls gang always wear their beer helmets when the decide the world is going to end (logic: so might as well party and get drunk). I didn’t even know of the existence of that song. I was trying to see if the da-da-dums fit to any of the songs from “West Side Story.” It’s more likely they fit “The Age of Anxiety”. Lennie was a character. If his “Mass” isn’t on the Roman Catholic Church’s Index of Forbidden Music, it should be. To be honest, I didn’t really know what was going on UNTIL Leonard Bernstine, then back tracking Pig & Rat managed to get the first two words of the song right (That’s great, it starts with an earthquake, birds and snakes, an aeroplane – Lenny Bruce is not afraid). THEN I saw the Michael Stipe photo and REM poster in the first panel. I don’t think there’s any great subtext to this strip. It’s a Sunday, and I guess Pastis just felt like jamming. it’s extremely subtle–the poster, the beer hats (I’ve seen them in a box before, but missed the beer hat reference), etc. but that just shows you what kind of REM fan *I* am. there are people out there who don’t know “it’s the end of the world as we know it”? who are over the age of, say, 18? How could you know that song at all and not know the line “It’s the end of the world as we know it”? Heck, it’s even the title! And where in the comic was the line “It’s the end of the world as we know it”? That was the point of the previous poster’s question. 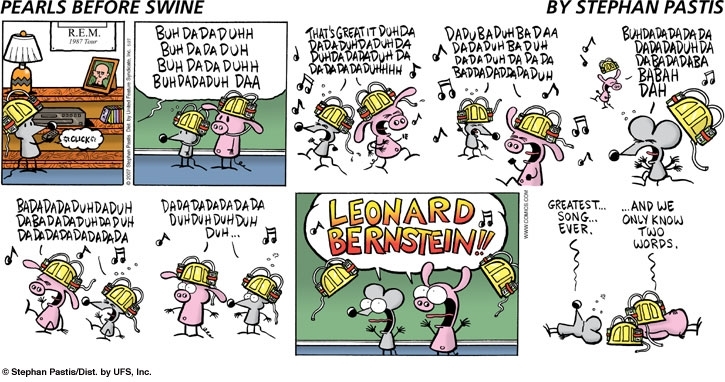 Leonard Bernstine doesn’t show up until the third verse or so, meaning they should at least know the chorus, which wasn’t included in the panels. I’ll accept it as a leap in logic for the sake of the the intended joke, now let’s put this one to rest. Not a big R.E.M. fan so I went to iTunes to see if I’ve heard the song before… nope, can’t say as I have. However, I did note that the track is #1 in popularity for R.E.M. selections above songs I do know like “Stand” and “Shiney Happy People” and “Losing My Religion”. Maybe the strip sparked mass curiosity? Tommy Boy tried to sing it. As I recall, David Spade and Chris Farley were singing the chorus, then immediately got lost during the first line of the next verse. I imagine “The End of the World As We Know It” is near the top of the list of Songs That Singers Are Terrified To Sing Live, just behind Tom Lehrer’s Element Song (because Modern Major General was too simple), and followed closely by Subterranean Homesick Blues (which is probably why Dylan used cue cards) and We Didn’t Start the Fire. I’m sure there’s a whole Top Ten to be had here, but I can’t think of any more just now. You really can’t assume that everyone knows who REM is or that we have even heard the song. I’m 32 and the only way I know the song is from my 3 year olds Chicken Little DVD. Cedric. Hmmm, is that an Amish name?